Lisa B. Rhine is the new provost of Tidewater Community College’s Chesapeake Campus. Rhine brings more than 24 years of experience in student services and academic affairs at the community college and university level, most recently serving as interim vice president for student affairs at Northern Kentucky University. Rhine began her career in higher education serving in various student services functions for 11 years at Sinclair Community College in Dayton, Ohio. 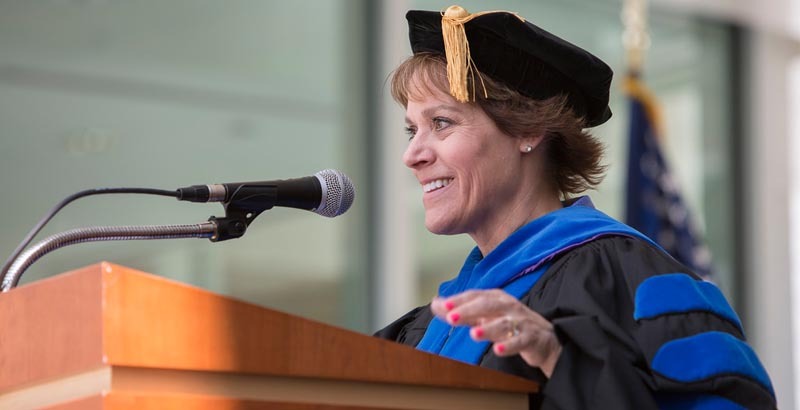 Subsequently, she took positions in academic affairs at the University of Dayton and then at Wittenberg University before returning to student services at Northern Kentucky in 2008. Her accomplishments include successful public/private partnerships, policy and program development, student retention and learning outcomes assessment. She holds a doctorate in educational administration from Capella University and a master’s in special education from the University of Dayton. She earned her bachelor’s in rehabilitation counseling from Wright State University and has a certificate in deaf studies from Sinclair Community College. Interim Chesapeake Provost Greg Frank returns to his post as dean of the Division of Natural Sciences on the Virginia Beach Campus.